I will give up meat for a month, use public transport for a week or put my hand into a box full of bugs all to raise money for the Eastern Barred Bandicoot. Voting has closed. The winning challenge is Give up meat for a month. Peter is raising money to support the Eastern Barred Bandicoot. Voting is now closed. Peter's pledge is closed for voting, but you can still support Peter and the Eastern Barred Bandicoot by making a donation using the 'Make a Donation' button above. Peter has pledged to complete the most popular challenge — Give up meat for a month. This pledge is part of the Hume City Council team. Help Peter raise money for the Eastern Barred Bandicoot. 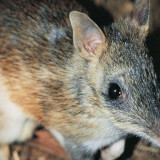 Support Peter Waite by donating directly to the Eastern Barred Bandicoot.